Learn signs that the caterpillar will be hatching soon. 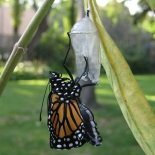 Explore what happens as the caterpillar outgrows its skin, how many times this happens, and how long it takes until the next stage, chrysalis. Discover what the caterpillar does when it is ready to begin the chrysalis stage. Ask the students about Stage 1 of the Monarch Butterfly Life Cycle and review what they learned about the Monarch egg. We will be learning about the second of the Monarch Butterfly Stages - the Monarch Caterpillar. 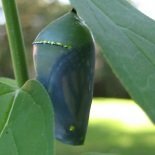 What happens to the "egg shell" after the Monarch Caterpillar hatches? How big is the newly hatched caterpillar? About as big as this comma , Note: Sometimes it is so tiny you can hardly see it and instead you first notice little "scratches" on the Milkweed leaf where they have eaten. What happens as the caterpillar grows and gets too big for its skin? It sheds its skin or "molts". How many times does the Monarch Caterpillar molt? About five times - depends on weather. What happens to the old skin? How much food does a Monarch caterpillar eat? Many Milkweed leaves...a medium size Tropical Milkweed plant (about 7-10 leaves). How long does it take for the caterpillar to become "full grown" and ready to become a chrysalis (pupate)? Why would it take only 9 days sometimes and 14 days other times? How big does the Monarch caterpillar get? What happens when it is time for the caterpillar to prepare to become a chrysalis? Use a ruler to put a line on the board representing the length of a full grown Monarch Caterpillar. Compare that to a comma , which is about the size of a newly hatched caterpillar. Older students could figure out about how much the caterpillar grows per day. Update the time line on the blackboard showing the Monarch Butterfly Life Cycle through the caterpillar stage. Have the students add to their “Virtual Butterfly” by representing the caterpillar on the work that they started last week with the Monarch egg. It takes about a month for an egg to turn into a caterpillar. Teach the four lessons over the month, correlating with this timetable. Review Monarch Caterpillar stage and tell them that in next week's lesson they will be learning about the Monarch Chrysalis.